The scale of destruction from cyclone Winston in Fiji is hard to comprehend. The pictures are just devastating. The death toll stands at 42 - which is just shocking - but many are saying it may still rise as communications improve. We pray it will not. The tiny village of Maniava, where a Youthworks Year 13 mission team spend time each July was literally blown away. Of the 32 houses, only 4 remain. We praise God no one was killed! You can read here about the extraordinary efforts our dear brother Claude (Dean of Suva) to get some food and basic first aid to Maniava (with rations on horseback!) thanks to the generous donations of Sydney Anglicans and other supporters of Anglican Aid. 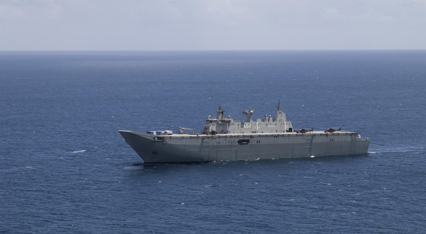 Another wonderful Aussie connection helping in Fiji at this very moment (and also close to my heart) is of course HMAS Canberra, first international aid ship to arrive. With her is hundreds of tons of food, shelter and desperately needed supplies, a state of the art hospital and lots of engineers and soldiers ready to lend a hand. Importantly, Canberra also brings her own helicopters, boats and large landing craft needed to get to remote islands where access has been difficult or even impossible because so many local boats were lost to the storm. It really is a terrific feeling when we get it right like this. And Sydney Anglicans and members of the Christian community more generally would be pleased to know that there are two Moore College graduates serving alongside the troops as Chaplains and providing much needed care and support to the locals who have been through such devastation. One in green (Army) and one in white (Navy), Phil Riley of 2RAR and Rendall (Max) Walker of HMAS Canberra. I so wish I was there too! How good is it that as we train up quality ministers of the gospel at Moore College, the Australian government is good enough to give them a ride to parts of world in desperate need and strengthens their arm as they seek to be light and salt to local people? And in this case Fiji, where we have so many dear brothers and sisters in Christ who have urgent physical needs, but who also need to know the comfort of God at a dreadful time. Oh, did I say there was a catch? We have to be prepared to go! If you are an ordained minister reading this, or thinking of such ministry in the future, why not you? If you don't stick up your hand to do a stint in the ADF as a chaplain, either full time or reserve, then who will? In my four years of wonderful association with so many wonderful people in Fiji though Year 13, I can attest to what warm, beautiful people they are, how little they have, how happy they are, and how Christian they are. (Compared to Australians who can be warm, who have so much, who are much less happy, and are decidedly less Christian). Please do remember the people of Fiji in your prayers, both individually and in your church gatherings. And please do check out the link to Anglican Aid and give whatever you can to help. The funds will go directly to those who need it, via local people we know and trust. In this way we can bless both the giver and the recipient. Rev Andrew Nixon was the Director of Youthworks Year 13 from 2010-2014 and is a Reserve Chaplain in the RAN.